I knew I wanted to be a pro cyclist when: I grew up in a cycling family, since my dad and brother were cyclists. My dad was also my first coach. Cycling has always been in my life and there was never that one moment in which I realized I wanted to be a pro. Greatest racing memory: Polish Championships road race, when I finished with bronze, and CCC Tour – Grody Piastowskie, which I was able to win. Nationals were special to me because I managed to get into the breakaway with world class riders and go head-to-head with them in the finale. Grody sticks out since I was at my top form and all I needed was a little bit of luck to win it. Race I dream of winning: UCI World Championships road race. If I wasn't a pro cyclist: I would work in IT. A pro since 2013, Lukasz Owsian's determination and effort have earned him the reputation of being a hardworking teammate and also led him to some great results. Last year he earned a bronze medal at the Polish national championships. He has finished second overall at the Tour de Langkawi and second in a stage of the Tour of Croatia. 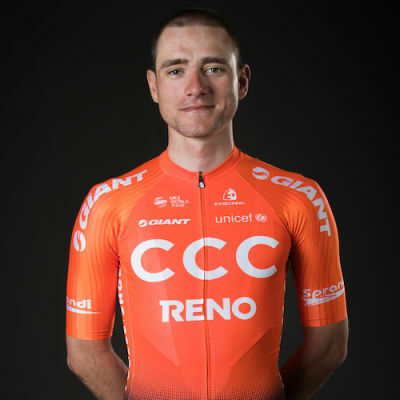 Owsian has lined up at two editions of the Giro d’Italia, in 2015 and 2017, and has frequently contributed to the team’s success as a domestique.